I woke very early on our second day in Cappadocia, hoping for the phone call from our fearless leader, Mert, saying that our hot air balloon ride over the landscape of the region was still on. Sadly, the weather predictions from the night before were correct, and it was too windy to fly safely. (Throughout our entire trip, Turkey was experiencing an unusual cold snap. The typical April average temperatures of 65 F (18 C) were often in the 40's!) Oh, well, this particular bucket list item will just have to wait for another trip. Rob and I headed downstairs for breakfast buffet in the hotel's dining-room-in-a-cave, then joined the group for an exploration of the little town of Mustafapasa. Rob greets one of the Cappadocia Estates cats as we walk into town. The town itself is not particularly lovely. It is small, dry, and dusty, with rather shabby old buildings, gravel roads, piles of construction mess here and there as the workers prepared for the tourist season. The coffee house of Mustafapasa where the men gather to share the news of the day. A rather large display of Viagra - no prescription needed! But when you looked past the first impressions, there were touches of beauty everywhere - painted walls and entries, carvings on the eaves of the houses, bright colors of scarves and ceramics in the shops that lined the streets. 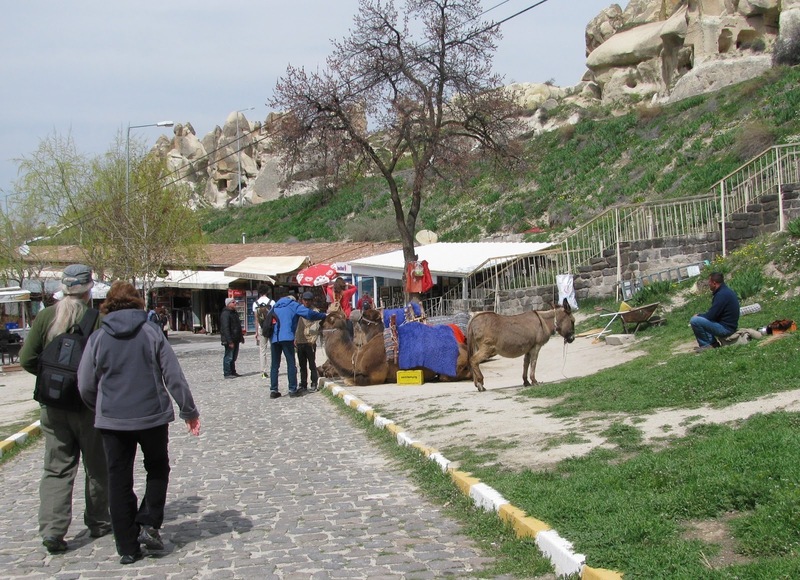 And, as everywhere in Cappadocia, there were both new and ancient cave dwellings all throughout the town. who accompanied us on our walk around the town! Mert escorted our group through the town, showing us good places to eat and shop, explaining the roles of various buildings. There is a university here, and we spoke to some students who passed by on their way to class about their lives and studies here. Mert introduces us to this friendly shop keeper. We bought some gorgeous scarves and ceramics here. We had a little time to wander on our own, then rejoined our group in front of the Old Greek House for a short bus ride to our next stop, the UNESCO World Heritage Site of the Goreme Open Air Museum. 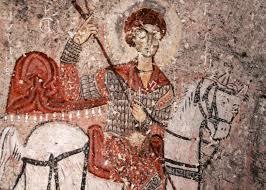 Early Christian monks of the 10th, 11th, and 12th centuries carved monasteries and churches into the cliffs and towers of this valley. 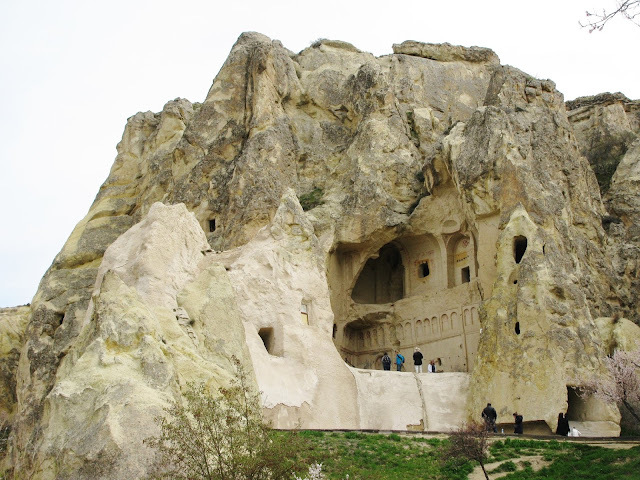 The tiny cave churches, most only big enough to hold a dozen or so worshipers at a time, give us a little peep into the past. Mert walked us around the compact complex to point out the tiny entrances to the various churches, and to provide some historical background, then left us on our own to explore the interiors. Mert uses Bobby's back to draw a common early Christian symbol. Mert used his drawing to explain the meaning of the word ICQUE. and when every other segment of the wheel is filled in, it forms a thick cross. 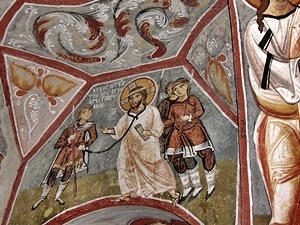 Ixoye is also the word for fish in Greek, and since Jesus was a "fisher of men,"
this led to the adoption of the fish as a symbol of early Christianity. An entrance into one of the tiny churches hidden in the walls of Goreme. 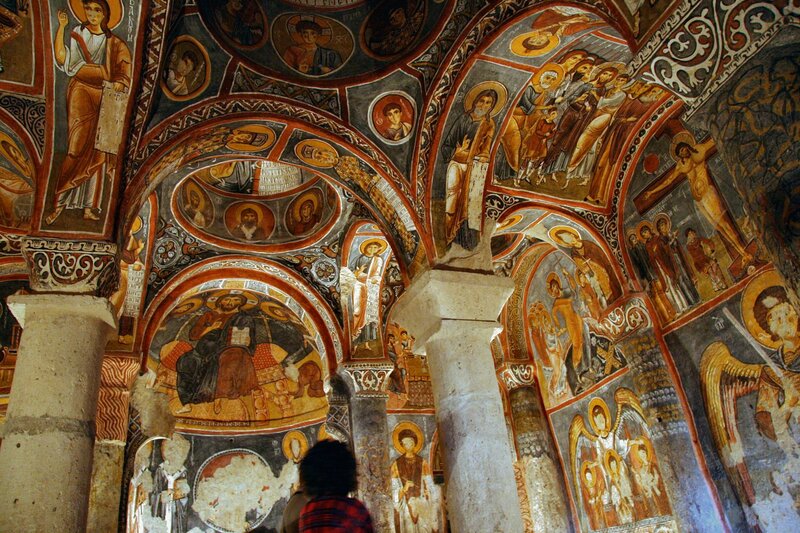 Most of the churches contain faint remnants of frescoes painted onto the stone walls, while helpful signs outside of each tell the story of each little chapel. Photography was not allowed inside the churches as the flash would quickly destroy what is left of the artwork, so I have borrowed some photos from free license images on Google. 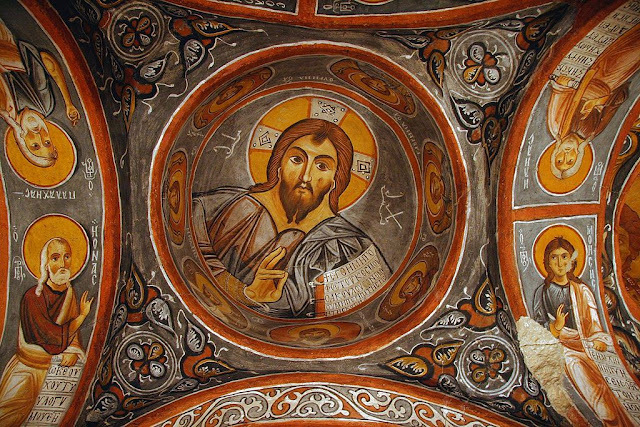 Fresco inside the "Apple Church"
Frescoes in Elmali Kilise, the "Apple Church"
The "Dark Church," Karanlik Kilise, with a beautiful facade carved into the cliff side, had an even more stunning interior. 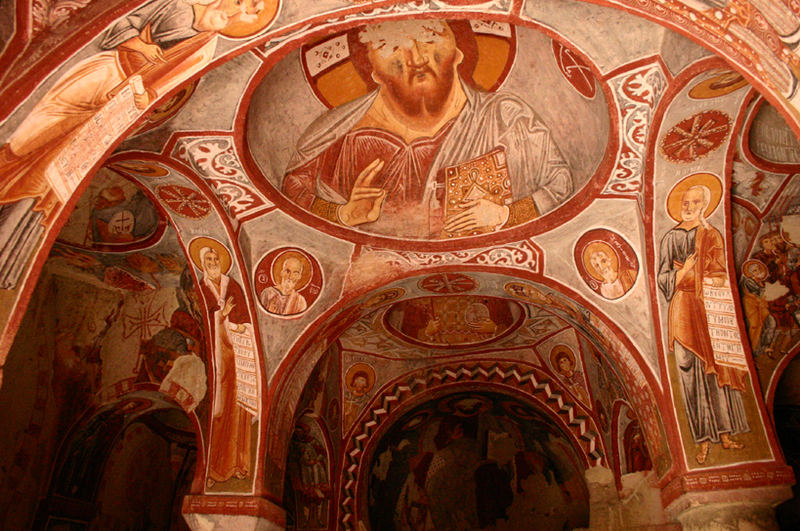 The church was larger and extended more deeply into the cliff than most of the churches, so the bright frescoes inside are extremely well preserved. Karanlik Kilise, the "Dark Church" carved into the mountainside. 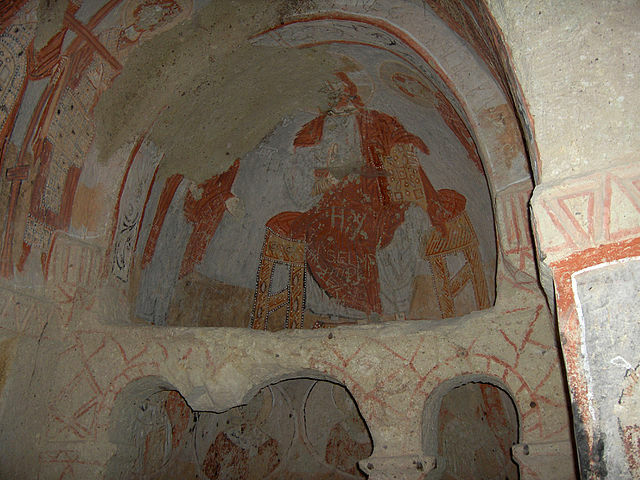 Thanks to: "Göreme OpenAir Museum Dunkle Kirche 2 11 2004" by Grizurgbg at the German language Wikipedia. Rob and I explored the rooms that would have served as homes for the monks. They are empty stone rooms now, but it was easy to imagine the busy life that went on here for centuries, with wine filling the vats cut into the floors, monks tilling the earth and planting grapes in the valley below. Across the canyon, we would see the pigeon roosts cut into the walls so the monks could use the pigeon droppings for fertilizer. Air vents were carved into some of the ceilings. An old vineyard in the valley below the monasteries. More caves were dug into the cliffs on the other side of the valley. Pigeon roosts cut into the cliffs. The pigeon droppings were collected and used as fertilizer. We wandered around the various towers of Goreme for an hour or so. After a visit to the gift shop and little bazaar below the museum, it was finally time to leave this remarkable site. The bazaar below the Open Air Museum. In the absence of dogs or cats, Rob found a camel to pet. Our tour members browse the little bazaar. Debra and Judie enjoy a break. 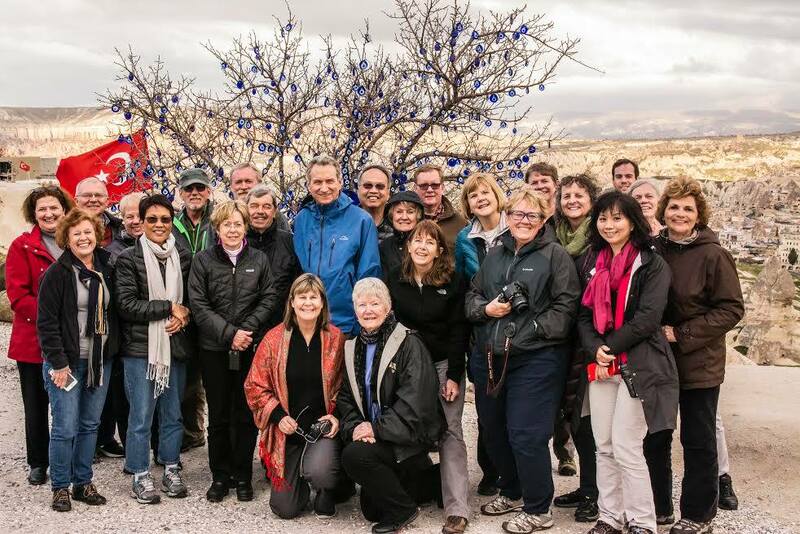 One of the many great benefits of traveling with Rick Steves is that his tours put you in touch with the people and the culture. Following our great visit to Goreme, we had our lunch in the home of Fahriye, a lovely woman living in Ortahisar, another of the many towns scattered through Cappadocia. Many of the homes were hidden in courtyards behind lovely decorated doorways. Our group enters the courtyard and Fahriye and her family. After removing our shores, we were welcomed into a little tower room at the back of her patio and overlooking the valley below. We sat on benches around the colorful carpet-covered floor. Fahriye and her daughter, Ayfer, served us a tasty meal of bread, salad, and beans - all from produce they grew on their own farm. Fahriye's beautiful Turkish carpets covered both the floor and the couches around the room. As we ate, the two women, with Mert translating, talked about their lives and answered our many questions. Fahriye and Ayfer were joined later by Fahriye's mother and Ayfer's daughter, Aylin, who had just returned from school, so we had the pleasure of meeting four generations and learning about the changes that had taken place in their lives over the years. As were many Turkish women of their generations, the great-grandmother and Fahriye were dressed in traditional clothing, but Ayfer was a modern girl, dressed in slacks and a pull-over. In spite of their dress, however, the older women were quite modern in their thinking and supported the rights of women to pursue an education and join the workforce. This visit was one of many highlights of our trip. ...as was this photo of her mother. Fahriye says farewell to our group. This woman from the village was outside Fahriye's house and entertained us with her tambourine. A little stall selling many kinds of nuts. Our final stop of the day was the Gallery Cappadocia near the city of Nevşehir, where we learned about the art of Turkish carpet weaving. The art of knotting Turkish carpets is documented all the way back to the 5th century B.C., with woven carpets dating back even further. 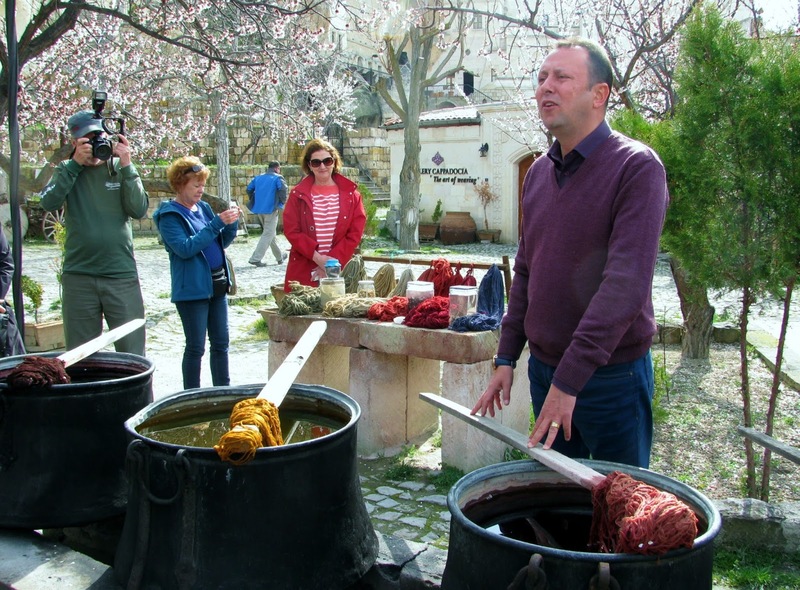 Our host met us outside the workshop and showed us the vats of natural dyes that are used to color the wools used in the carpets. Inside, women were sitting in front of looms demonstrating the knots used to create the intricate patterns of these beautiful carpets. We learned about the difference between the single knot and the double knot carpets, and some of our tour members got to try out their knot-tying skills. There are several types of Turkish carpets: the kilim is a traditional wool carpet with no pile that is woven on a loom. The traditional knotted carpets still made by hand in villages in this region is wool-on-wool (both the strings on the loom and the knotted pile are made from wool). The next type is wool on cotton, which allows for a tighter weave. The most luxurious and expensive is silk on silk, and this workshop weaves its own silk thread right in the store. Debra and Peng watch this woman separate the strands of silk from the cocoons. This machine spins the silk thread. Following the demonstration, we were seated on long benches around the large showroom and served apple tea in traditional tulip-shaped glass cups. As we drank, the carpet show began. Several young men began laying out one after another of the beautiful carpets as our enthusiastic host described the type of carpet, the region it represented, the significance of the designs. The kilims were followed by the wool-on-wool, then the wool-on-cotton, and finally the silk-on-silk. These men wait to roll the carpets out at our feet. The kilims came out first. These were followed by wool-on-cotton. As the carpets were unrolled, our host explained the designs and history of the carpets. The gorgeous colors of the Turkish carpets. Soon the entire room was filled with a thick layer of carpets and we were welcomed to come and inspect them close up. As we oohed and ahhed, we were joined by a beautiful dog who ran into the room and dived into the pile, taking great pleasure in rolling around on top of the rugs. Kathy, Ben, and Pat examine the carpets up close. This dog knew exactly what he wanted to do! He rolled ecstatically all over the carpets as soon as the demonstration was concluded. Rob misses our Maggie dog at home when we travel, but he manages to get some puppy love. And, as everywhere in Turkey, there were cats here, too. Rob and I came thiiiiiis close to buying a beautiful carpet, but we wanted more time to look through all the offerings and make sure it was just the right one, so we have made a pledge to return to Cappadocia again one day to find our perfect Turkish carpet. The carpet we almost bought. In the late afternoon, we rode back through the lovely countryside, stopping for a few photos. The best tour partners we could have asked for! A Turkish farmer tills his land the old-fashioned way. Today was a day filled with wonderful memories from beginning to end. After returning to Mustafapasa and freshening up, we walked back down to the Old Greek House for another great dinner. After dinner, we were joined by several members of the family and others from the village for music and dancing - another delightful cultural experience! Mert joins villagers from Mustafapasa who entertain us with traditional Turkish music. Mert and his friend enjoy a dance. This fellow was obviously having a wonderful time! He danced the night away. And our group members joined in the fun. Other villagers arrived to share their music. A dad and his daughter watch the dancers. What a wonderful ending to one of my favorite days of our entire tour!